Double skinned extruded aluminium slats are used in medium to high security situations and come in standard and bespoke colour options. They can have vision and ventilation slats incorporated and are all made to measure. This heavy duty version is made up of thick, double-walled, extruded aluminium laths, 37mm deep, approx 6mm thick. Will withstand bricks etc being thrown at them without causing sufficient damage to stop them operating properly. 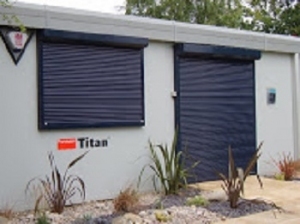 The ideal security shutter for office windows, shop fronts, patio doors, pharmacies, schools, warehouses etc. Little dearer than the standard grade, but offering much higher security and peace of mind. Very difficult to force these shutters and almost impossible to jemmy them out of their guides, due to the very rigid nature of the extruded slats. Can be operated a) Manually by neat pull cord inside the building, b) Manually from outside by means of spring & lock in bottom lath (heavy duty extruded for extra strength), c) Electrically from internal wall switch, or d) Electrically via remote control hand transmitter (at nominal extra cost).Come as standard in White or Brown. Any RAL or BS colour on request to match your property or Company colours. Nationwide installation service on these security shutters. Orders for multiple shutters enjoy additional discount. Very quick lead times. Made in the UK.